We silkscreened a few GO OGRES shirts/hoodies! Using a design featuring three Jerry Seinfelds blindly drawn lovingly by Matt Gordon. There are only 4 in circulation now, custom made for some buddies, but maybe in the future we'll print more. If you want one, send me a message and we'll work something out! 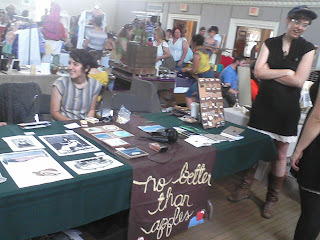 I tabled at The Broke Affordable Arts Fair in Peterborough, New Hampshire! 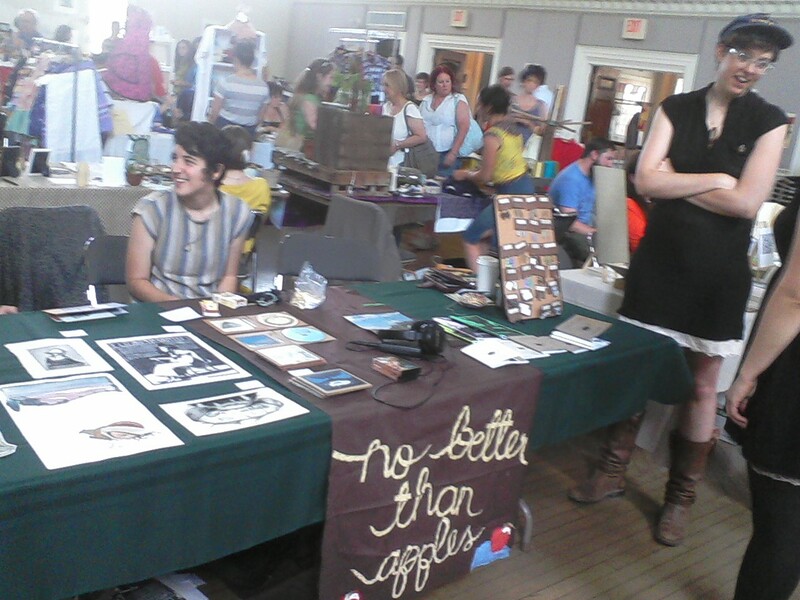 I sold zines, tapes, CDs, and earrings alongside of Matt who was selling prints of his lino-cuts and etchings. All the earrings and pins I didn't sell will go up on Etsy soon enough. I was not in good enough shape to play at The Thing in The Spring, so Klessa had to cancel. Red Sled Choir played in our place, however, and I think I'd be hard pressed to find anyone there who felt slighted by the switch. Matt really nailed it. Go Ogres tapes can now be found at Jack's Rhythms and Rhino Records in New Paltz: two amazing independent record stores we are lucky enough to have in town. Pansy Twist distro, based out of Toronto is carrying them as well! You can order 'em through our bandcamp, too. I'm *very* slowly getting zines out to stores and distros. I am trying to be patient with myself, and I hope everyone is being patient with me: I'm at one twentieth of my typical pace with these things and I owe a bunch of shipments! So far, you can find my new zine at Inquiring Minds Bookstore in New Paltz, and TwelveOhTwo distro in Toronto, who will be tabling all over the place this summer!